This last year has been another great one for Nostell. I want to send my personal thanks to the amazing core team and all the vounteers who , week in and week out, make Nostell the lovely parkrun we know. Also. thanks to National Trust Nostell for all their help , support and assistance. 2019 will be welcomed in with the run starting at 10.30 - I will advise the route tomorrow for you. Throughout the year, the core team will endeaver to bring you joy and enertainment when it is Easter, halloween and Crimbo. And we will be celebrating 5 years in July - so watch thisspace for details of that . As always, any offers of help during our year are always gratefully received. So, before I detail the 2018 state, it remains for me to say "Thank you to each and every one of you - volunteers, walkers, joggers, runners, babes in pushchaits, dogs on leads- hope 2018 was good and have a lovely New Year - see you in 2019 !! Just a quick reminder we are running an extra parkrun on New year's day - 1st Jan 2019. We set off at 10.30 am but PLEASE PLEASE PLEASE be there for 10.15 for pre-run brief. Anyone wanting to volunteer - please look on our webite annd send a message - you will enjoy free parking !!! See you all soon !!!!! This week 238 of you ran, jogged and walked the course, of whom 26 were first timers and 35 recorded new Personal Bests. Representatives of 26 different clubs took part. Congratulations to one of our RDs and founder members of The Nostell parkrun Core Team, Georgi NEWTON who ran her 250th parkrun today. Leyla BROOKE (another of our RDs) and Bev FLOCKTON ran their 50th runs and Evelyn BROOKE her 10th. Well done all. Leyla BROOKE is RD next week. She'll need plenty of volunteers so shout up if you can help. A polite request. Please don't leave jackets etc on the railings outside the Courtyard or in front of any door under the arch. You're welcome to leave them anywhere else under the arch, but not there. Thanks. Today's full results and a complete event history can be found on the Nostell parkrun Results Page. Run Report #191 - The one Pre-London and Terry Still Finished on Under 17 minutes! Hi there, this week 249 people ran, jogged and walked the course, of whom 48 were first timers and 43 recorded new Personal Bests. Representatives of 24 different clubs took part. Terry Forrest ran an amazing 16:51 then ran back to Normy then got the train to London then ran 2:38 in VLM. Super mn doesn't ome near and we are proud to have Terry as one of our regular runners. Awesome. we had a few milestones - Simon Bennet nd Jacqueline Richardson, Angela Hannon all completing 100 runs, and junior adam Bernrdo completing his 50th in great style, making his dad eat dut all the way round ! Mark Gawlyk junior sompleted his 10th run. Emma Bird is you RD next week so let's get on nd fill her volunteer roster up PDQ.!! So long, farewell, auf weidesein, au revoir to 2017. Nostell parkrun unfortunately could not celebrate our last run due to Jack Frost leaving his horrid mark yesterday. But quick stats up to the end of run #176 - The female record is held by Jennifer WALSH who recorded a time of 17:42 on 27th September 2014 (event number 10). The male record is held by Adam PEERS who recorded a time of 15:57 on 30th July 2016 (event number 105). The Age Grade course record is held by Jenny WAKEMAN who recorded 88.37% (21:21) on 1st January 2016 (event number 74). Nostell parkrun started on 26th July 2014. Since then 5,001 participants have completed 30,187 parkruns covering a total distance of 150,935 km, including 5,687 new Personal Bests. But at this time of year it is a reflection on more than stats. It is a reflection of the people who make Nostell the best parkrun. It is the 5001 runners who have crossed our finish line, it is the army of volunteers who stand on cold, windy, wet corners and cheer those 5001 runners on, it is the volunteers who click the stop watches 5001 times, it is the volunteers who scan 5001 barcodes and then 5001 finish tokens, it is the funnel managers, it is the token givers, it is the little children who make sure you all put your finish tokens in the bucket, it is the people who stay and cheer in our very last participant each week, it is the people who help set up the course and then take it down again. It is the National Trust staff who are always there to help - from car park sorting to first aid when it was necessary. In short, each and everyone of you make Nostell happen. Our core team of run directors has grown and strengthened. We now have 2 event directors when we welcomed Steve Berry to that role. Steve has proived invaluable and was instrumental in devising the new course when it becme necessary to change the old route. he is far more tecky than I am and will shortly be posting details of our route for tomorrow. So for now, thank you to each and every one of you, you are truly my parkrun family and make Saturday morning an absolute pleasure. And finally, if you have not already volunteered in 2017, why not start 2018 on a high and help out? We still need a couple more marshals, 2 timekeepers and a funnel manager. Please help out, please make sure our unique event takes place. It is always with deep regret when we have to cancel an event. Three times recently - including today - we walked the course and found several pockets of deep ice. Our course is not suitable for spikes and we have to consider the safety of approximately 200 runners. Some of you are experienced and could place your feet in safe places and run correctly on icy surfaces, but many parkrunners are starting their running careers. We cannot subject any of you to any form of danger when that danger is avoidable. I hope you all appreciate the need to cancel and that the decision to do so is NOT taken lightly but as a safety issue. Please be there early enough to attend the briefing. 2017 saw our 3rd birthday celebrated in our usual style - fancy dress - on the beach theme. The weather wan't too kind though but those who did dress up and all who took part enjoyed the event. We had a Halloween Run, we had a Chritmas run, we have had pacing events. We have had the most amazing teenagers join us and go through their DoE duties. They have proved an invaluable part of our volunteer team and hopefully they will continue to support us once they have completed their awards. We welcomed Steve Berry as co ED and our RD team has gron to include Lesley Needham, Emma Bird, Leyla Brooke and Sarah Smith - was Hartley but got married in the summer. These peeps are proving themselves to be strong and capable run directors which means Pat can start to stand down a bit more. After a year of being in and out of hospital, including a spell with sepsis and being in intensive care and close to the end, I would like to say a huge thank you to all my parkrun family for the care, wishes and support during and after that. You were truly there for me and mentally helped me as well as physically when I could begin to get back. But 2017 is not yet finished, we still have 30th December to run and then it is all systems go for our New Year's Day run. Starting at 10.30 am. We have devised a unique route for you and with full permission from Nostell parkland can promise you a beautiful run. The details of this route will be published on 31st December so watch this page and our facebook page for details. Because of it;s uniqueness, we are asking for all runners to attend the pre-run brief at 10.15am on 1st. I will tell us all how far how many of us have run after our 30th December run. For now though, many thanks to Nostell staff, to my amazing core team of RD's, all the volunteers and marshals throughout the yar and those who are helping going forward. See you all soon !! Unique because it is the 2nd of a possible 2 runs you can do this day and get double recognition. Unique because for one day only we are staging a unique course, to be revealed later........ Hopefully it will be as special to you all as it is to me. Please come along and join in all the fun and runs.... If you cannot run, why not volunteer insted? 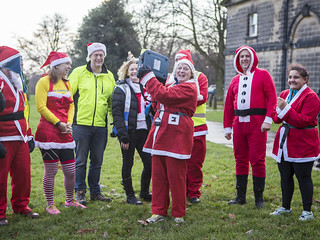 Saturday 23rd December is- as you all know - the closest parkrun to Christmas this year. So, it's all about dressing up. Santas, Mrs Santas, Elves - good and bad, snowmen, snow ladies, snow kids, reindeer, angels (not many of them at Nostell I bet !!) christmas presents, holly, mistletoe, sledges, turkey, mince pies, crackers ....... The lot of you !!!!! Start at 9.oo am but please be early if dressing up for photo at 8.45 am.